Taking “overcompensation” to a new level. Sunset works to keep the missiles from targeting Parnell while Iron Man tries to help Jocasta fight her influence. Rhodey shows up with Parnell’s wife and manages to talk him out of fighting Iron Man since Parnell still owes Rhodey a debt. 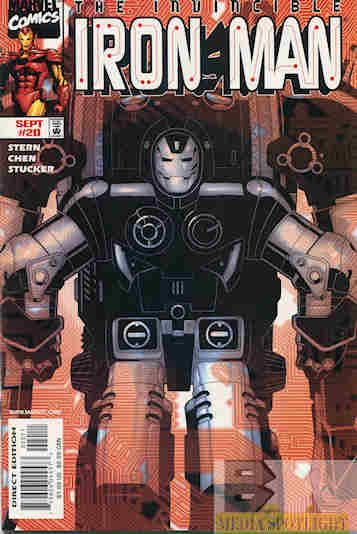 So Parnell leaves with his War Machine armor but not the exo frame, which Iron Man uses to fight Sunset’s missiles. He then goes to rescue Jocasta, who has decided to destroy herself rather than be controlled by Sunset, forcing her to delete all her files to avoid going to prison. What Sunset doesn’t know is that Jocasta manages to download her programming into the armor’s computer, which Tony then uploads into his house mainframe. As he celebrates what victory he’s had over Sunset Bain, Tony is unaware that yet another dead Madame Masque has been found in Puget Sound. What they got right: This is a good completion of the story arc. The victory is satisfactory and allows Sunset to potentially return as a villain. Jocasta gets a new lease on life. Parnell could also continue to be a problem with his own War Machine armor. What they got wrong: Except he never shows up again in the main continuity, coming back once in an alternate one. And I hope this Madame Masque mystery is building up to something interesting. I honestly don’t remember after all these years. Recommendation: A good three-part story worth looking into. Posted by ShadowWing Tronix on December 4, 2018 in Marvel Spotlight, Yesterday's Comics and tagged Iron Man, James "Rhodey" Rhodes, Jocasta, Madame Masque, Marvel Comics, Marvel Universe, Parnell Jacobs, Sunset Bain, Tony Stark, War Machine.